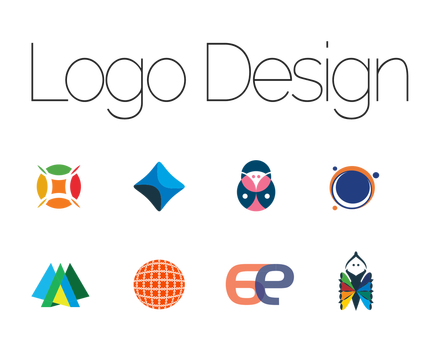 Before working on a final logo of any one design, you must develop 20 different logo ideas using your company name or initials. Brainstorm! These are quick ideas. Create a file in Adobe Illustrator that is 20 art boards size 3"x3"
Then redraw your favorite 5 ideas again with more detail- see if you can mix and match them for another new idea. From these better ideas, pick your favorite. The final design idea must be 3″ x 3″ and completed in Illustrator. Your logo should use color if you wish, but you also need to keep in mind that a good logo also looks fine in black and white. If you choose to use color in your logo, also submit a black and white copy also. Elements and Principles of Art. After you have at least 20 logos, look at them and pick your favorite 5. if there are interesting ways to combine a couple of these five in different ways, force yourself to come up wth at least 3 more ideas by mixing up your favorite five. Think about all the synectic triggers you can use for thinking abou thow to combine, dissect, reshape, modify etc… the letters. ​Submit at least 10 variations here!